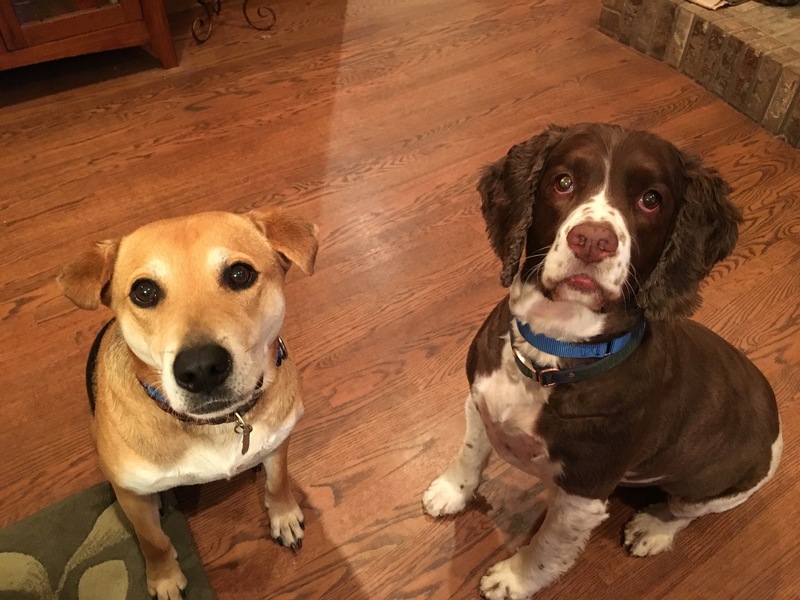 Danni (left) is a five-year-old Sharpe / Shepherd mix who lives with Reggie, an eight-year-old Springer Spaniel who is becoming grumpy and sometimes aggressive; growling at the family’s son, at dog parks, etc. The family’s mother mentioned that Reggie is sometimes growley when she (their primary guardian) takes him to the vet, but once they take the dog away form her, the growliness stops. This made me suspect the dog was being possessive of the mother. When I sat down with the guardians to discuss the situation at the start of the session, the family’s 21 year old son told me Reggie sometimes growled when laying on the floor next to the chair his mother. and he approached. He leaned over to demonstrate this behavior and then pulled away after he didn’t see a response from the dog. But the dog was reacting, just in a very subtle way. His pupils dilated, he stopped breathing and stared right at the son with a slightly lowered head and ears in a forward position. These are warning signs that the dog was giving, but the son didn’t see them. To confirm this was the case I had him lean back in and sure enough, the dog responded with a bark and snap. I dropped a leash over his head and led the dog out of the space, then put him into a sit. Once the son moved away, the dog stopped completely, but I suggested that they immediately use the leash to have the dog leave the area as a consequence for this sort of action. I noticed that Reggie got into the personal space of all the humans in the room and that they petted him each time he did so. This reinforces the behavior so I suggested that they stop petting him when he does this and then showed them how to claim their personal space. When a dog gets right up in our business, it can be an indication of a dog that doesn’t respect personal space it can indicate that the dog is needy or doesn’t have the proper level of respect for the human’s authority. This will be particularly important with Reggie and the mother as I believe his growley behavior is related to his being possessive of her. As we were wrapping up the discussion on claiming personal space, Danni came over and after the mother claimed her space, the dog jumped up on her. This was the dog’s way of disagreeing with the rebuke. I used this opportunity to show them my technique to disagree with a dog that jumps up. This is the first time I have posted this technique on my site, so if you are reading this, you got lucky! Here is the vid. Usually the leader dog is the one who is in charge of security when dogs live in groups. Often my client dogs have taken on this job on their own. Allowing them to do so can often give the dog an inappropriate feeling of authority. Because of Reggie’s behavior, held;on him see and identify as being a follower will go a long way towards changing his behavior. To help with this process, I showed the guardians how to claim the area around the front door when guests arrive. This is one of my favorite exercises as the dogs usually get it and change right away. The distance helps the dogs not get as intense when someone knocks or rings the door bell. Another important part of this exercise is the dogs are literally behind the guardian. This is the follower position. But when you have multiple dogs, it can be more challenging for sure. This was quickly apparent when the guardian went to repeat the exercise and answer the door herself. While she was ultimately successful, it took far longer than it should have. I made a few suggestions that will help her get better results in the future such as using a tennis racquet to extend the reach of her arm. I suggested that the members of the family text each other when they are heading home so that they can practice this door answering exercise. This way we remove the anxiety that often comes when we are a little embarrassed by our dog’s behavior when someone arrives at the door. If the dogs continue to challenge and come forward when the guardian uses the tennis racquet, the next step is to practice the exercise with each dog individually. This way the dog can learn the new behavior that is expected without distraction. Once both dogs are on the same page, then we can go back to practicing the exercise with them together. Another great way to change the leader follower dynamic is to walk the dogs in a structured way. Because of Reggie’s habit of pulling in front (the leader position), I pulled out a few Martingale collars and showed the mother how to apply the special twist of the leash. By the time we finished the session, both dogs were more respectful and responsive to their guardian. They aren’t hard cases, but it will be important that the guardians continue to claim their space, pet with a purpose and immediately disagree when Reggie starts to show any signs of possessiveness. As he starts to see and identify as a follower, his perception that its ok to correct and calm people will dissipate and eventually go away completely.